Elizabeth Lulu “Liz” Stottlemyer, age 81, formerly of Creagerstown and most recently of Taylorsville, died Saturday, December 15, 2018 while under the care of Carroll Hospice at Glade Valley Center, Walkersville. Born August 12, 1937 in Frederick County, she was the oldest daughter of the late Andrew “Bill” and Lulu Wiles Altman. She was the wife of Franklin Merhl Stottlemyer who died in 2004. Liz grew up on a dairy farm in New Midway and developed a love for farm life there. She married Franklin, a dairy farmer, on February 19, 1962 and they farmed together until his illness and death. Liz was a life member of the Evangelical Lutheran Church, Frederick. 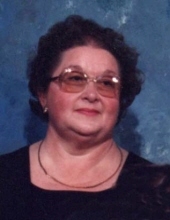 She was a 1955 graduate of Walkersville High School, enjoyed taking care of flowers and mowing the lawn and her hobbies included needlework, putting jigsaw puzzles together and scrapbooking. She was a Redskins fan and enjoyed watching baseball and golf on television, as well as playing with and watching her grandson’s creativity. Surviving are daughter, Vivian Rose McCuller and husband Chad, grandson, Matthew, all of Union Bridge; sisters, Mary Kaufman of Walkersville and Genevieve Valentine and husband Leroy of Thurmont; aunt, Frances Wiles of Frederick, nieces, cousins and brother-in-law, Carroll Stottlemyer and wife Cecilia of West Virginia and many friends. She was predeceased by an infant grandson, Merhle Franklin McCuller on December 1, 2012 and a brother-in-law, Russell Kaufman in 1993. A funeral service will be held at Hartzler Funeral Home, 404 S. Main St., Woodsboro, 1:00 p.m. Tuesday, December 18, with Pastor Janet Comings, officiating. Interment will follow in Utica Cemetery. The family will receive friends at the funeral home Tuesday from 12 noon until service time. In lieu of flowers memorial contributions may be made to Utica Cemetery, c/o treasurer, John Grove, 111 Kline Blvd., Frederick, MD 21701 or to Carroll Hospice, 292 Stoner Ave., Westminster, MD 21157. To send flowers or a remembrance gift to the family of Elizabeth L. Stottlemyer, please visit our Tribute Store. "Email Address" would like to share the life celebration of Elizabeth L. Stottlemyer. Click on the "link" to go to share a favorite memory or leave a condolence message for the family.